Sequentia Legenda created quite a shock wave when he released his immensely poetic Blue Dream at the beginning of 2015. Very active on the social networks, the French musician announced in the early stage of autumn the making of his second opus which was inspired and dedicated to the love of his life, “Amira”. And as you were seduced by Blue Dream, as you will be invades by the very magnetizing approach of “Amira”. First of all, the approaches are identical even if the confrontations, as rhythmic as harmonious, cross the parallelism. The title-track, as much the short version as the long one, begins with a movement of sequences which makes sparkle organic keys over delicate wooden tom-toms and of which the fragile tic-tac are getting lost in the invasion of a heavy bass line. Ponderous and ambient, this line lays down a long river of floating rhythm on which get graft bouncing pulsations, sequences and their furtive shadows as well as, especially, layers of voices which follow constantly the subtle modulations of the phases of meditative rhythms. This is how we have the subtle impression that the music of "Amira" follows constantly a progressive increase. Nevertheless the music evolves delicately, weighing down even its status of pensive music with some sober electronic percussions. We can say that the movement is delicately jerky, at times one will even have the impression to hear a rider of the modern times makes trot his horse and so spread the perfume of his loving poetry, with the multiplication of loops hypnotic rhythm which crackle in its envelope of crescendo. Layers of astral violins harmonize their effects of tickler of shivers with these layers of voices which raise at times their ethereal harmonies, following thus the curve of feelings, sometimes disturbing, from the orchestrations. It's enthralling and we easily let this rather repetitive movement wraps us. 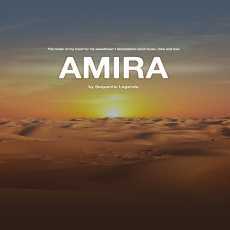 "Somewhere" is unarguably the most beautiful track in “Amira”. And this, even if the resemblances can alter our initial judgment. Superb layers of floating voices, very Schulze by the way, enhance the velvety of its opening. That does very French cosmic years at the same time as very Schulze of the Body Love years. Intense, the movement is riddled with electronic effects which water abundantly the delicate modulations of the bass line and of this choir in halftone with its astral perfumes which dissolve in others more chthonian. Rustles stimulate our perception. We have the impression to hear the flow of waters oozing on the imperfections of caves. And other percussions, I would say arrhythmic beatings, argue these heavy atmospheres by drawing a figure of rhythm which remains well coiled up in its shroud of atmospheres, as mortuary as cosmic. And little by little the structure of rhythm solidifies its presence with more fed beatings, pushing "Somewhere" near a good cosmic rock of the vintage years, but with a contemporary tone, a little after the bar of 10 minutes. Our soul connects with this soft rhythm which is coated of wave-like loops, with hoops in the forms of boomerang, with layers of voices and with cosmic effects. A rhythm which follows the tendency of the electronic riffs, accentuating a pace minutely installed in its minimalist cocoon and in the signature of Sequentia Legenda who succeeds in maintaining outside any kind of anesthetic state. A signature which charms since Blue Dream and which becomes a kind of object of dark desire that we cannot explain but which does downright its effect.